Arrow season 5 has won back a lot of fan acclaim by taking things 'back to basics,' as it were. 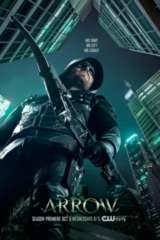 Sure, there was a big alien invasion time-spanning crossover with the other CW DC TV shows (The Flash, Supergirl, Legends of Tomorrow), but other than that, Arrow has kept itself grounded in a wonderful seasonal storyline about Oliver battling the vicious crimelords (Tobias Church), killers (Prometheus), and rogue vigilantes (Vigilante) of Star City. Hell, even the Russian themed flashbacks have been good! However, as of its latest episode, Arrow has really pushed things to a whole new level. We (and Team Arrow) now know that D.A. Adrian Chase (Josh Segarra) is actually the killer known as Prometheus - and with that information out in the open, a delicious and deadly game of cat and mouse has begun. Get a preview of Arrow's Next Episode in our Photo Gallery above, and be sure to Rat the show for yourself Below!